As we all know, music for teenagers is more to do with personal identity than aesthetic appreciation. My own 15 year old son is witheringly dismissive of virtually every form of music known to mankind and the intensity of his Scorpio rising views can be quite scary, unless I remember my own at his age. At the beginning of the 1970s the only acceptable bands were Pink Floyd and Yes, pretty much everything else was met with a reaction laced with obscenities. Needless to say, country music king and America’s best-selling performer, John Denver would have been given the shortest of shrifts. Of course, this was a good few years before an awareness of astrology contributed to a somewhat wider recognition of what was acceptable and what wasn’t, whether in the field of music or humanity in general. By the end of that decade, my need for personal identification with the ” right ” people was not nearly so acute, and may well have extended to Denver, particularly since we shared a Sun sign and the same Pluto square Sun transit that had brought astrology into my life, had drawn him espouse to Democrat politics and environmental causes. Denver’s music was unashamedly wistful and sentimental, its praise for the rocky mountain country life perhaps a fair reflection of the Sun in Capricorn and the Moon in Pisces, but this article is not going to be about his music. Astrologers, like everyone else change the way they look at their subject as they acquire more experience. This triple Capricorn initially approached astrology in the same way as anything else, by learning the rules by rote and applying them in the same order every time. So for Denver, I would have done the Sun in Capricorn thing, followed by the Moon in Pisces, then Ascendant Gemini and on to Sun in the 8th, Moon in the 10th etc etc. Its a tried and trusted method, and if you are after their basic character, you can’t really go wrong. Over time, I realised that I wasn’t so much interested in people’s character descriptions as in the main thrust of their lives and the kind of events that would occur to them. Consequently these days my first thought when looking at a chart is are there any challenging major aspect patterns and / or extremely close aspects ? 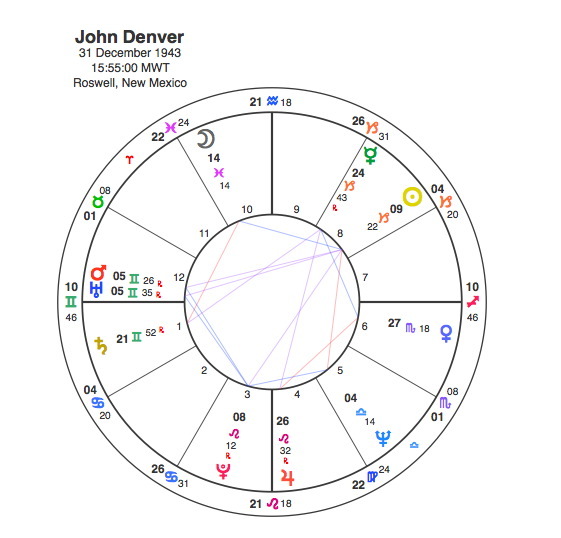 So when I look at John Denver’s chart, I immediately see Mars and Uranus a mere nine minutes apart as part of a Finger of God aspect including Pluto, pointing to an apex Sun. By any way of looking at it, this is an extremely difficult aspect pattern and the fact that Mars / Uranus is conjunct the Ascendant adds to its power. It also really doesn’t seem to fit the picture presented to the world by the gentle music of John Denver. Whenever you see Mars, Uranus and Pluto in difficult aspect together you can pretty much guarantee that a sudden, unpredictable, probably violent and dramatic life changing event will happen and it will almost certainly occur when Pluto renews its relationship with Mars and Uranus by transit. Mars conjunct Uranus is an erratic aspect, usually that of a risk taker, someone who is drawn by the excitement of dangerous activities. In his private life, John Denver was very keen on two activities, skiing and solo plane flying. Mars, Uranus and Pluto are also known to be a very accident prone combination. The most concerning thing about this pattern is that it points to Denver’s Sun in the 8th house of death. On October 12, 1997, John Denver was killed when his experimental plane, crashed into Monterey Bay. Throughout 1997, Pluto was opposite Denver’s Mars / Uranus conjunction. Uranus was also opposite his Pluto. On October 12th, Mars was at 9 Sagittarius also opposite his Mars / Uranus / Ascendant conjunction and making aspects to his Pluto and 8th house Sun. Sadly this is one of the clearest astrological indicators of accidental death that Capricorn Research has ever seen. John Denver’s Pisces Moon might have made him sing about ” Country Roads ” taking him home but the rest of his chart meant that he couldn’t stick to them.